What did I do wrong? How can I connect a UICollectionViewCell subclass to a xib, and display it in a UICollectionView? Make sure the cell on the .xib file know what's the type of the cell. You can find the answer in this document UICollectionView adding UICollectionCell. Not the answer you're looking for? Browse other questions tagged ios iphone uicollectionview xib uicollectionviewcell or ask your own question. Should IBOutlets be strong or weak under ARC? 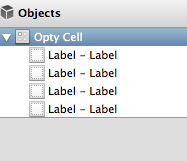 How can we load .xib files in collection view cell in iOS? How can I optimize loading images from URL for uicollectionview?